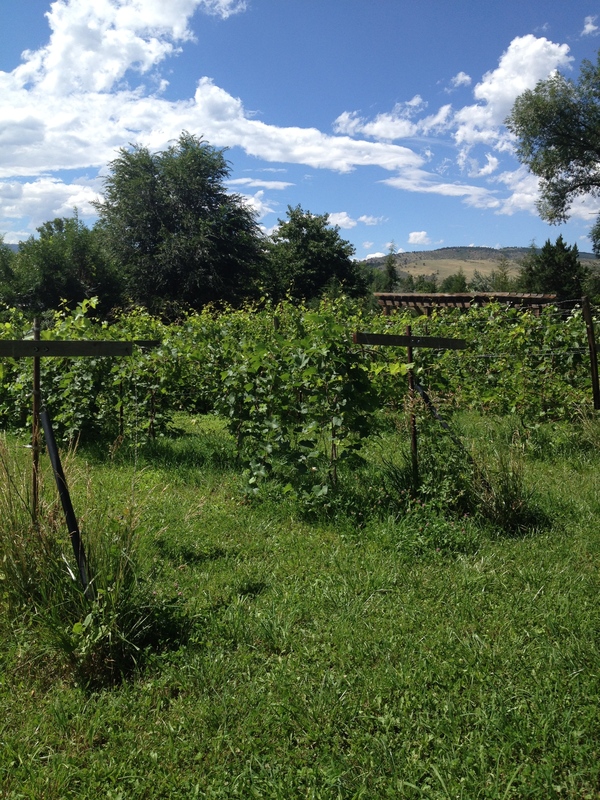 Everything I learned about grapes, I learned during my visit to Stonebridge Farm in Colorado, where the viticulture is a force of empowerment and a return to the grow-your-own values of self-reliance and sustainability. Even though I know a bit more than I did when I first put my grapevine in pot, I just mostly like eating out of my garden, so I’m also game to learn all I can about how things work. Before I knew what I didn’t know, I put the grapevine on the front walk. The benefits of this are that I can see it as I come and go and give it attention and water as needed. Plus, it gets full sun for most of the day, while still enjoying the relative shelter of the house, which protects it from wind and inclement weather. What a rush it’s been to see the vine reach up toward the sky like an Olympic champion with her arm held up in triumph. This is the kind crazy wonderfulness that I want to live with every day. 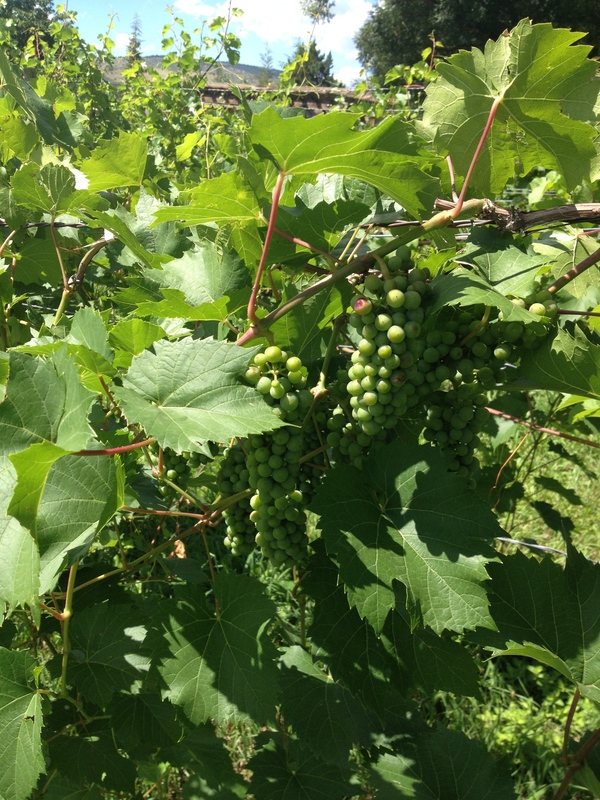 Our new grapevine is productive and healthy. She grows quickly, but the shape is wrong at least in my mind. (By the way, most producing plants are female to me, just as all cats are female and all dogs males. That’s just how it is for me. Isn’t it the same for everyone?) I’m thinking about how to prune and train her. We have time to work on these things next year once she’s in the ground. I found out from Farmer John that because we don’t add hormones, something that is often done to enlarge commercial grapes, they have a thin, delicate skin, which breaks open with the slightest pressure, releasing their sticky-sweet syrup for a finger-licking delight. They’re simply delicious, but there’s no way they’d make it to market. We had only one cluster to sample this year, but the future seems promising. Our plan is to plant the vine in a sunny spot this fall and let the monsoon do its work. Grapes are just another of the pleasures of urban farming. Soon I’ll be able to add them to the menu when Hal asks, “What’s for dinner?” I can always say, “There are plenty of greens and grapes in the back.” Today there’s mostly a lot of curly and dinosaur kale and collards, but that’s food. The new lettuce is in, and it’s tender and delicious. Next year we might have grapes to go with our blackberries and the new bed of strawberries we put down. Really, you don’t know what you’ll get until you try. Beautiful grapes you’re growing! Wish you could join us for tomorrow night’s Whey and Wine class of cheese-making and wine-tasting! 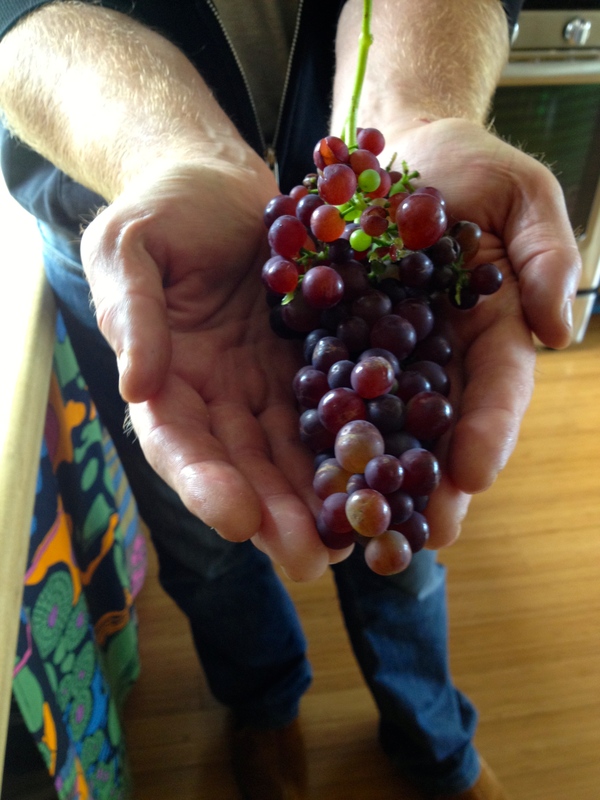 Why that bunch of grapes is almost as beautiful as the strong helpful hands holding them.